Kitchen Window: Nettles Bring Spring To The Kitchen Stinging nettles are an overlooked bit of nature's bounty, their prickly leaves hiding a secret: They're good-tasting and good for you. (Consider them a stand-in for spinach.) To find them, just pull on some gloves and head out into the wild — or to a farmers market. 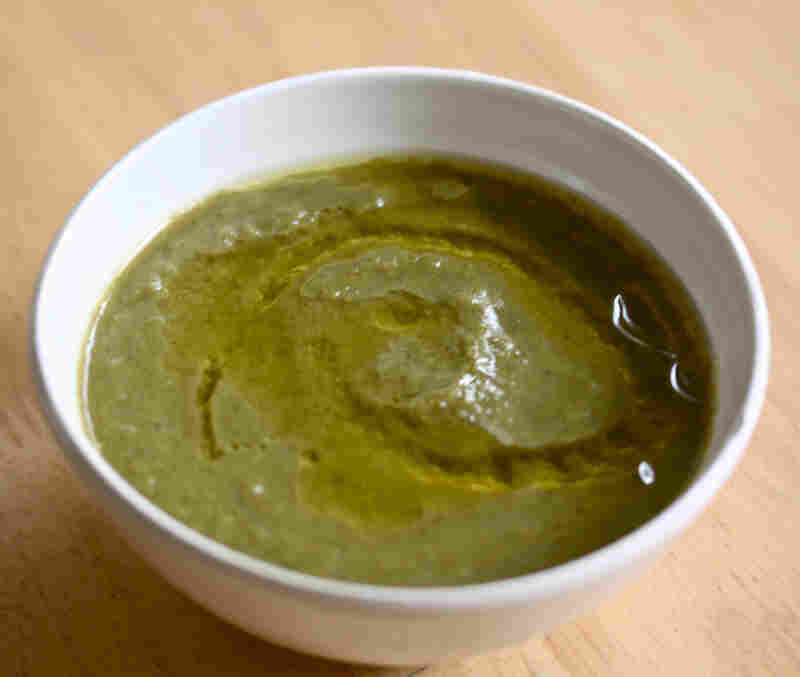 Get recipes for Nettle Soup, Nettle Tart, Nettle Pesto and Nettle-Lemon Risotto. My in-laws live in a half-wild, magical place perched along the edge of the Northern California coastline about an hour from San Francisco. On nice days — and even when it rains — my husband and I will take their black Lab for a ramble up into the woods behind the house where banana slugs carpet the narrow trail, salamanders creep shyly through the trees alongside it, and the air is full of birdsong and the good, damp smells of the growing things. I had an inkling that despite their sting, nettles might be an overlooked bit of nature's bounty, their prickly leaves couching a hidden secret: Not only are they good-tasting but they are good for you. It also is a place where you could almost eat off the land, particularly if you like your greens. Depending on the season, there are blackberries, thimbleberries, huckleberries, miner's lettuce, fiddlehead ferns, wild fennel, nettles, mushrooms and probably more growing rampant in forest and field. Availing oneself of nature's bounty can be as easy as pulling on a pair of gloves and heading out into the wild (or just pulling the stuff growing next to the road). After years of avoiding nettles as much as possible, I decided it was time to address my loathing. Indeed, I have a long and rather frustrating history with the plant, and it's not been pretty: backpacking trips in the Point Reyes Seashore, where I've unwittingly strode through an overgrown meadow pockmarked with the stuff, leaving me with an unpleasant, lingering sting for the remainder of the trip; or accidental brushing against their vibrant green leaves while on a run and painfully ruing my carelessness. Still, I've wanted to do something in the kitchen with nettles for a long time. I had an inkling that despite their sting, nettles might be an overlooked bit of nature's bounty, their prickly leaves couching a hidden secret: Not only are they good-tasting, but they are good for you. And it's true: Nettles are high in iron, potassium, manganese, calcium and vitamins A and C (and are also a decent source of protein). The word "nettle" describes more than 40 different flowering plant species from the Urtica genus, which comes from the Latin word "uro," meaning, "I burn." The plant is native to Europe, Asia, Africa and North America, and is found throughout the continental United States. Nettles are readily available in spring and summer. Nettles are used as a medicinal herb and can help in treating arthritis, anemia, hay fever and kidney problems, among other ailments. Dried leaves may be used to make a tea that is useful in alleviating allergy symptoms. Any vegetable that can provide a great nutritional bang for the effort to cook it is always appealing to me. Plus, nettles grow wild, and all I'd have to do is go pick them (after pulling on protective clothing first, of course). As I also learned, picking nettles is a fairly simple endeavor (simpler still is a friendly farmer at the market who will sell you a bunch already bagged). Look for young plants in spring and summer when you are ready to forage. The key is to pick the leaves while wearing thick gloves and a long-sleeved shirt (and pants) and then, as soon as possible, plunge the leaves into a pot of boiling water, and you'll be left with a sleek, slick pile of vivid green leaves. After cooking, nettles produce an entirely sting-free eating experience. 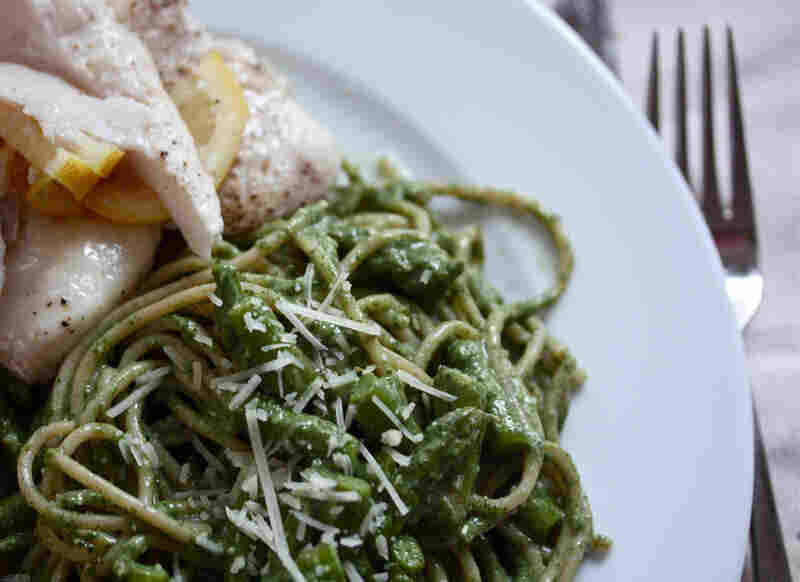 Back in San Francisco, my nettles rested awhile in the refrigerator before I had time to fold them along with almonds and a bit of Parmesan cheese into a semi-traditional pesto recipe that tasted fresh and bright, with a subtle undertone of spring. It was delicious — slightly floral, slightly woodsy and slightly (but only just) reminiscent of spinach. I tossed it with whole-wheat spaghetti and chopped, steamed asparagus for a hearty and satisfying dinner. I've also made a wonderful nettle tart and a creamy, leek-infused soup that had me regretting any earlier cursing of the plant. Look at nettles as a substitute for spinach, and you will have no trouble coming up with any number of ways to incorporate this unassuming wild plant into many favorite dishes. This spring I have been able to bring the woods into my little urban kitchen because of those nettles, and that to me is argument enough that I should go out foraging again. Soon the blackberries will hang heavy on their thorny branches, ripe for jam, and I will tuck delicate miner's lettuce into salads laced with a sprinkling of huckleberries. The days will stretch out long and longer still, and I will gather nettles as often as I am able. To cook nettles, wash and drain, discarding stems. Place the leaves in a pot of boiling water and cook for 3 to 4 minutes until nettles are wilted. Drain through a colander and press out any excess water. 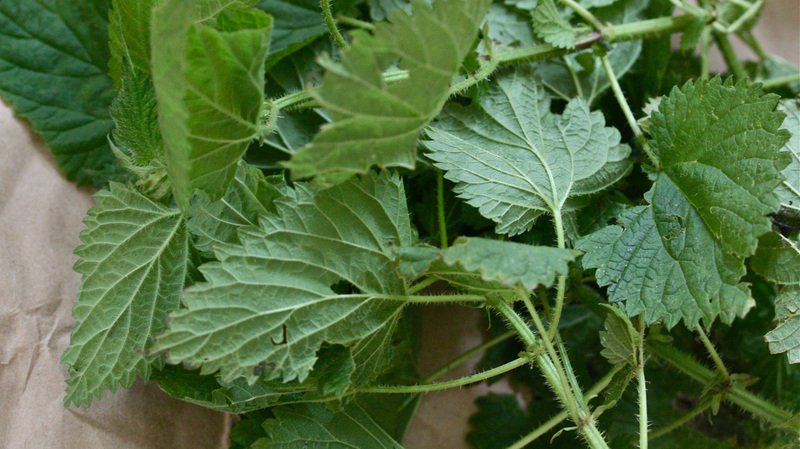 Nettles may be stored in an airtight container in the refrigerator for up to 5 days. When foraging, only pick the nettle tops (the top four leaves) and make sure the nettles are less than knee-high. Discard the stems. An annual plant, nettles are found in woodsy areas and forests, in natural grasslands, along fertile fields and riverbanks, and along shaded trails. Always be careful to wear thick gardening gloves and protective clothing when picking. Although being stung by a nettle or eating an uncooked nettle is not dangerous or poisonous, you will probably wish you hadn't. Hearty and nourishing, this soup tastes like the woods and spring. A little heavy cream added at the end lends a touch of richness. In a large soup pot over medium heat, warm the olive oil. Add the carrot, leeks and potato and cook for about 10 minutes, until the vegetables start to soften. Add the stock, bring to a boil, then reduce heat to a simmer and cook for 10 to 15 minutes, or until the potato is soft. Add the nettle leaves and simmer for about 1 minute to wilt. Remove from heat. With an immersion blender or in a food processor, blend the soup until very smooth. Return to the pot and season with the salt and pepper (add a little more to taste if necessary), then stir in the heavy cream if using. Serve the soup drizzled with olive oil. Spinach may be used here in a pinch, but try to use nettles if it's at all possible. The tart may be made ahead and served warm or at room temperature. To make the crust, place the whole-wheat pastry flour in a large bowl. Whisk and cut in the olive oil with a fork until the mixture resembles coarse meal. Whisk in the ice water a little at a time, until the dough just begins to hold together. Form into a ball, wrap in plastic wrap, and let rest in the refrigerator for 20 minutes. 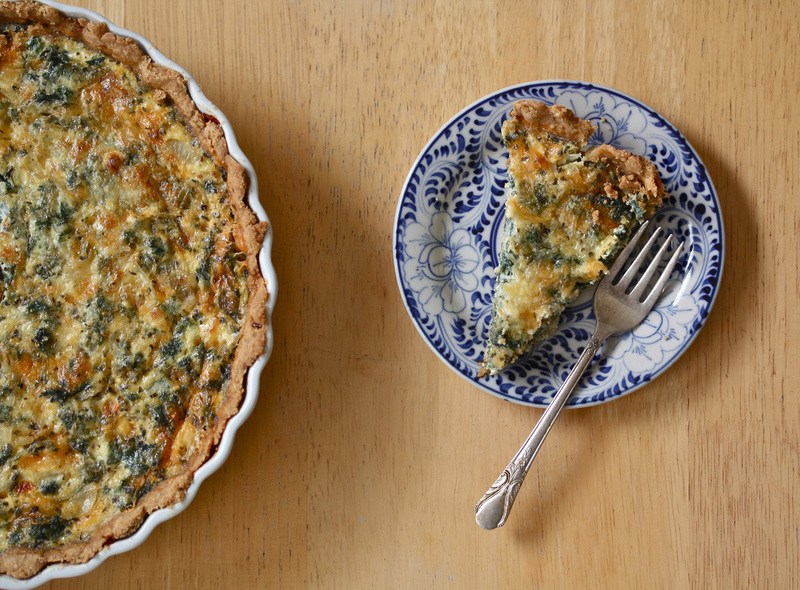 Roll out the dough, fit into a 9-inch tart or pie pan and prick the bottom lightly with a fork. Place in the oven and bake for 15 minutes, until crust is slightly golden. Remove from oven and set aside. Meanwhile, make the filling. Bring a large pot of salted water to a boil and add the nettle leaves. Boil for 3 minutes. Drain and rinse with cold water. Drain again and set aside. When cool, chop the nettle tops into thin strips. In a medium saucepan, heat the olive oil and add the shallots. Saute for about 4 minutes, until soft. In a large bowl, whisk the eggs. Add the milk and cream, and whisk to combine. Stir in the cooked nettles, salt, pepper, thyme and Gruyere cheese. Pour the filling into the tart shell and sprinkle evenly with the grated Parmesan cheese. Place in the oven and bake for 30 to 40 minutes, until surface is golden and puffed. Remove tart from oven and let cool slightly before serving. I like lots of garlic, so have included 4 cloves here, but adjust to your taste. For a vegan version, omit the cheese and try adding a bit of lemon zest for a flavorful, dairy-free boost. Pair this with pasta, drop dollops onto bowls of asparagus soup, or spread on little toasts and top with thinly sliced radishes and a sprinkling of sea salt. To cook the nettles, place leaves in a pot of salted, boiling water for 3 minutes or so, drain and squeeze dry. Coarsely chop. In a food processor, combine the pine nuts and garlic. Process to chop coarsely. Add about half the nettles and process to chop coarsely. Add the remaining nettles and olive oil and process until a thick green sauce forms. If the sauce is too thick, add a little more olive oil. Add the cheese and dash of lemon juice, and season with salt and pepper. Process briefly. Pour into a glass jar or other container and top with a thin layer of olive oil to prevent the surface from discoloring. Cover tightly and refrigerate for up to 2 weeks. 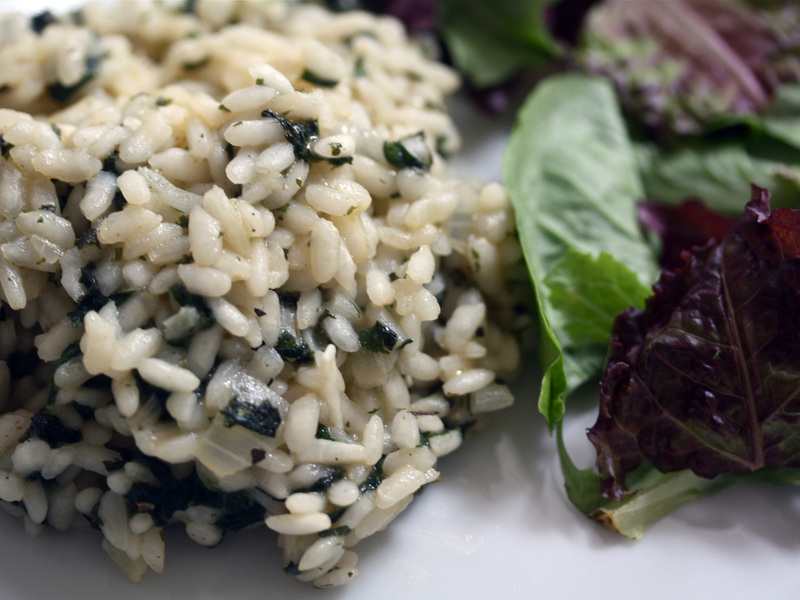 Simple and lovely, this risotto is bright with lemon zest and is punctuated with a floral note from the nettles. It makes a light and satisfying vegetarian main dish when served with a crisp salad, or pair it with poached wild salmon fillets. In a large saucepan, heat the olive oil over medium-high heat. Add the shallots and the garlic and cook for 3 to 4 minutes, until vegetables are slightly softened. Add the arborio rice and cook for another minute, until the rice is well coated with olive oil. Pour in the white wine and bring the mixture to a boil, then lower heat to medium and simmer the rice, stirring frequently, until the wine is absorbed. Add 1 cup of vegetable broth and stir frequently until it is absorbed into the rice. Repeat with 5 more cups of broth. Rice should be tender and creamy (not dry). Reduce heat to low and stir in the nettles, stirring well to distribute evenly. Stir in the Parmesan cheese and a little more broth if the risotto seems dry. Cook for about 3 minutes until the cheese is melted. Stir in the salt, pepper, dried herbs and lemon zest. Serve immediately.